1. What sand is used in the sculpture? When creating a sand sculpture, we can use either brickies sand or beach sand. Brickies sand – is a square quarried sand and allows us to get a nice solid block of sand after it is compacted. These sculptures are more expensive than a beach sand sculpture due to the process required during bump in and bump out plus they take longer to carve. The benefits of these sculptures are that you can really create intricate detail in the sculpture, they can be created to any height and if protected from the rain can stand for more months - even years. Beach sand – sculptures made from beach sand are normally created in one day and are more affordable as we normally only need to bring to the beach the sand sculptor and his tools. Depending on the size of the beach sculpture you may need labourers to assist the sand sculptor or additional sand sculptors. The downside of a beach sculpture using Australian beach sand is that you can only obtain limited detail in the sand and normally only achieve around 1.4metres in height. 2. What happens when it rains? Sculptures created from brickies sand can survive light drizzle and rain over a number of days. This is due to the compaction process and the bio degradable sealant that we use to protect the sculpture. If heavy rain couple with strong winds are forecast the sculpture will need to be covered with a light plastic sheet to protect it from absorbing too much rain. If damaged in the rain – a sand sculptor can return to repair the sculpture – once the moisture has evaporated from the sand. Sculptures at outdoor events have been known to survive up to four months. If built inside – or under a structure or marquee – weather is not an issue. Sculptures created from beach sand are very vulnerable to rain – they may survive a light shower that passes through – but heavy rain and winds will destroy the sculpture. We always advise our clients who engage us for a beach sand sculpture to have a marquee or cover on stand-by in case of bad weather. 3. How long will a sand sculpture last? A brickies sand sculpture housed inside and protected from vandalism will stand for as long as you would like it to with minimal care. A brickies sand sculpture built outside – sealed and then taken care of during bad weather will remain standing for up to 4 months. Although if severe weather passes through than it may need to have a sand sculptor onsite for a few days completing repair work. Sand Sculptures created with beach sand will only last the day that they are created and maybe one or two days later depending on the qualities of the beach sand and how well they are protected from vandalism. 4. Do we add anything to the sand? We only add water to the sand – with both types of sand sculptures. 5. What tools do sand sculptors use? 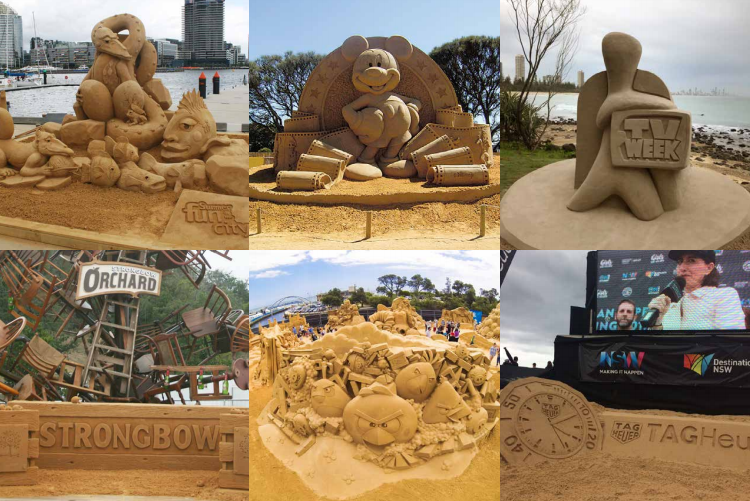 Sand Sculptors use a variety of different tools – including shovels, trowels, levels, pottery tools, dentistry utensils, horse combs, cake decorating knives, straws, brushes plus more. It is really interesting looking into the sculptor’s tool box. 6. Can you provide me with an indicative price? Indicative prices for sand sculptures are not possible without us having a quick 5 to 10-minute chat with you – there are so many cost variables including location, date, the client’s timeline, sand be used, size of sculpture and subject matter, access point for the sand- both in and out. We have worked with many clients that have weight loading issues. These are able to be averted by replacing the core of the sculpture with a light weight high density foam. 8. What’s the design process? Over the past twelve years, working for over 350 clients – we have always been able to carve what the client has visualised. The design process is done in close conjunction with the client – and we usually find that after one or two drafts the design has been nailed. Clients sign off on the design before the sculptor arrives on site to create the sculpture. We also find that with such an extension portfolio of work we can provide our clients with marketing images to assist with the promotion the upcoming sand sculpture installation. 9. How is the sand brought into location? If we are using brickies sand to create the sculpture – it will be brought into the location in one of two ways – depending on site access. Have the sand delivered to site in one tonne bags on pallets. These are then forklifted off the truck and pushed into position with a pallet trolley one bag at a time. Labourers are then used to hand shovel the sand into the timber formwork. Removing the sand is the same process in reverse. This is the process used in 98% of all projects inside shopping centres, convention centres, functions centres etc. We have the sand delivered loosely on the back of a small truck and tipped directly at the location that the sculpture is to be carved. Labourers are used to assist the sculptor to get the sand into the forms. When the sand is removed – it is either hand shovelled back into the truck – or if the location allows –a small bobcat will be used to put the sand back into the truck. This is the process we use in most projects that are outside in parks, ovals, malls etc. 10. How long does it take to carve a sand sculpture? The amount of time required to carve a sand sculpture depends on the type sand used, the client’s timeline and the intricate nature of the design. Brickies Sculptures - On average though a 3 to 5-ton sculpture takes 3 days, a 7 to 10 ton sculptures 4 days, a 12 – 15-ton sculpture takes 6 days and a 20-ton sculpture 7 days. Time can be shortened on the larger sculptures if two sand sculptors are engaged for the project. Beach Sand Sculptures – Take one day to create and the size will depend on the number of sculptors and labourers engaged for the project.